You may want to watch this trailer with the lights on. The first preview for “It,” a horror movie based on Stephen King’s novel of the same name, arrived Wednesday — and it’s appropriately terrifying. “It,” for the unfamiliar, tells the story of a group of children in a town in Maine who come together after people in the neighborhood begin to disappear. This brings them in direct conflict with Pennywise, a clown who captures children and devours them. 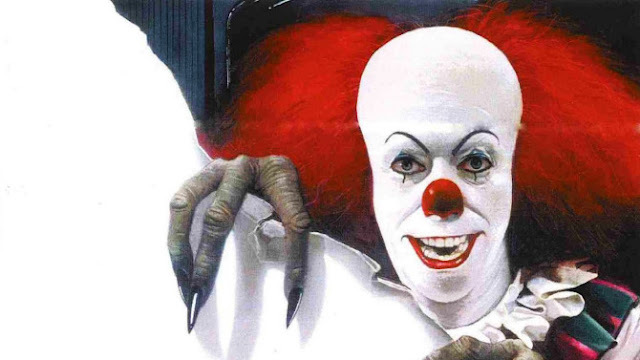 The book was previously brought to the screen in 1990, in a TV mini-series that starred Tim Curry as the horrifying villain. Both have undoubtedly contributed to a rise in coulrophobia. The new adaptation — due in September — appears to double down on the circus horror. The trailer offers a sense of foreboding almost immediately. Dark skies, a rainstorm and a muted color palette all suggest something ominous lurking just offscreen. Even if you know what’s coming, it’s terrifying when Pennywise, this time played by Bill Skarsgard, pops up from the sewers. The preview never gets less creepy. There’s always tension in the sustained string chords of the soundtrack, and it imbues everything with suspense and darkness. At one point, even a red balloon appears unbearably sinister. But the most frightening moment belongs to a malfunctioning slide projector that starts to advance itself. The camera cuts between slides on a screen and panicked children trying to shut it off. The music builds as Pennywise’s face finally appears. “What are you afraid of?” The trailer ultimately asks. As if it doesn’t already know. 0 Response to "The New ‘It’ Trailer Is Here to Give You Nightmares"